LIGHTWEIGHT, STYLISH & DURABLE: Made of high-quality, 100% polyester felt. This soft and stylish felt organizer will add volume to your tote or handbag, helping it keep its shape whilst protecting your delicate essentials like glasses, smartphone, tablet and camera. Not only will this keep your bag organized, it also looks great atop your desk or dresser, keeping all of your accessories neat and tidy in one place. Accessories and purse not included. STAY ORGANIZED: It's time to tackle that jumbled abyss in your tote or handbag. Travel in style. Plenty of pockets to keep your items like cosmetics, eyeliner, lipstick, pens, lip balm, moisturizers, keys, smartphone, glasses, notebook, and much more well-organized. GIVES SHAPE TO YOUR DESIGNER TOTE & HANDBAG: This organizer fits LV Speedy 30, LV Neverfull MM & Longchamp Large Le Pliage Tote. STURDY & LIGHTWEIGHT: Weighing in at just .26kg (9.3 ounces), this bag-in-bag insert won't add much extra weight to your purse, tote or handbag. 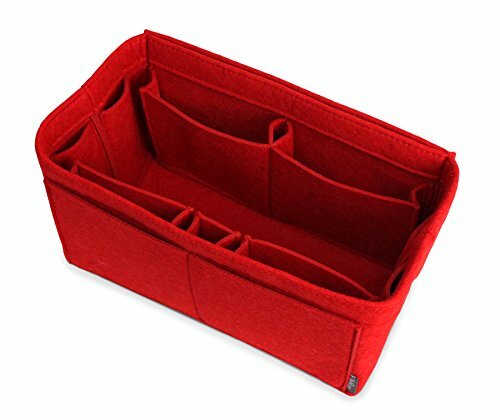 The thick felt walls of this sturdy organizer will cushion and safeguard your delicate items and help your bag keep it's beautiful form and shape; say goodbye to wilted handbags. If you have any questions about this product by Pelikus, contact us by completing and submitting the form below. If you are looking for a specif part number, please include it with your message.